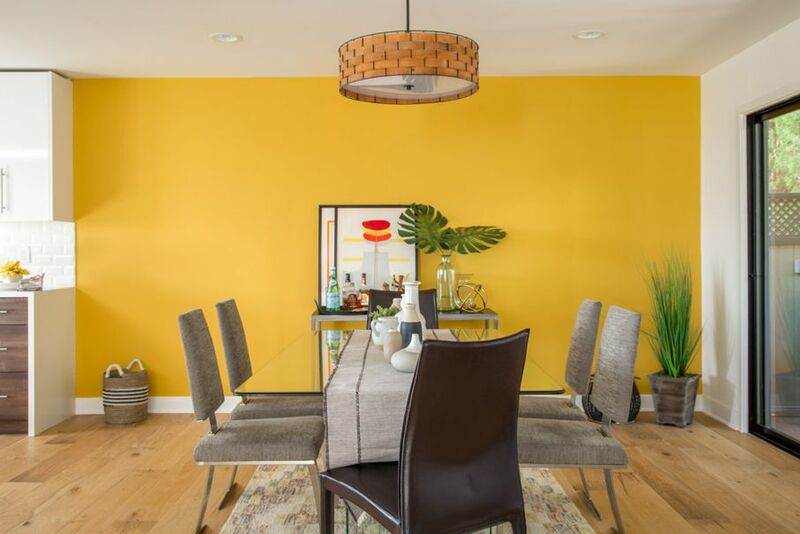 New Honey Glow makes a bold, yet sunny statement as the 2017 Color of the Year. 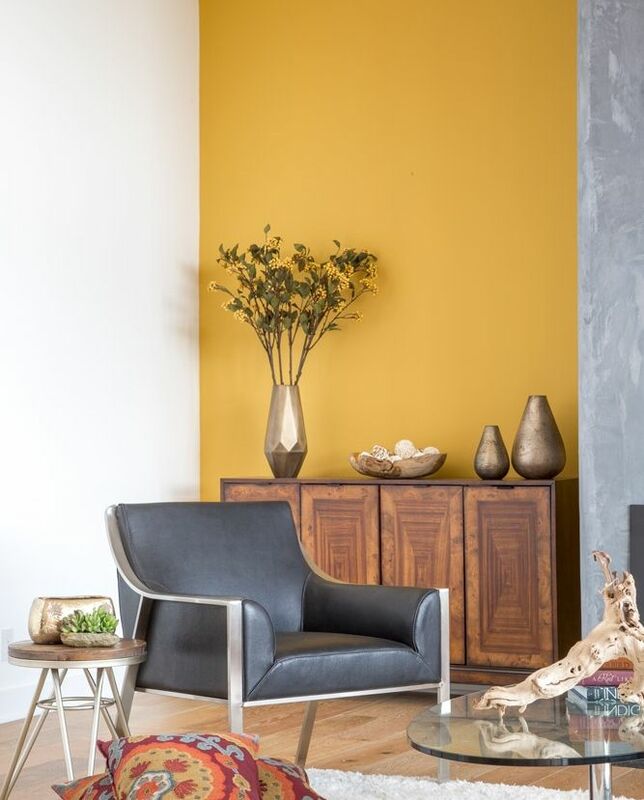 Bold, bright, and cheerful, it was impossible to overlook the 2017 Color of the Year displayed by Dunn-Edwards Paints at the Dwell on Design show in Los Angeles. We loved the warmth of the new color Honey Glow as presented by this leading Southwest manufacturer and supplier of architectural and industrial coatings. We also admired the company’s environmental focus as it is determined to donate a share of all the sales generated by Honey Glow to a nonprofit fighting to keep bees from extinction. “As nature’s pollinators, bees contribute to the survival of all life on our planet – and we can think of no better way to celebrate life than to support these magnificent creatures,” says the Dunn-Edwards website. Since 1925, this LA company has been providing a complete line of paints to professionals and consumers. Operating primarily in Arizona, California, Nevada, New Mexico, and Texas, Dunn-Edwards Paints focuses on providing premium architectural coatings for a variety of uses including residential, commercial, hospitality, health care, and schools, said Tim Bosveld, the company’s vice president of marketing. But Dunn-Edwards Paints is also known nationwide for its extensively researched color reports. For 2017, the Color and Design Trends report is entitled “Beyond Wild Imaginations,” for the quirky, the bohemian, the globetrotter, the pioneer, and the innovator. And Honey Glow – the color of the year – lives up to that wild side. 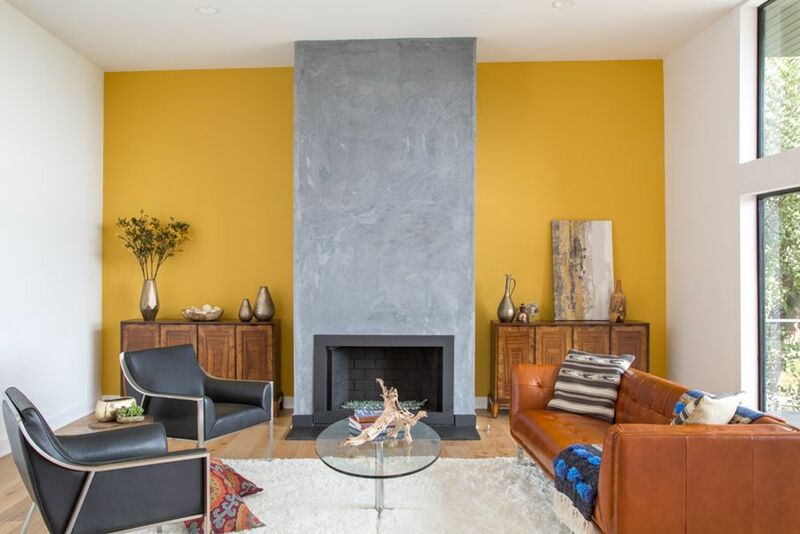 It is a warm, golden yellow with orange undertones that commands attention in any space. 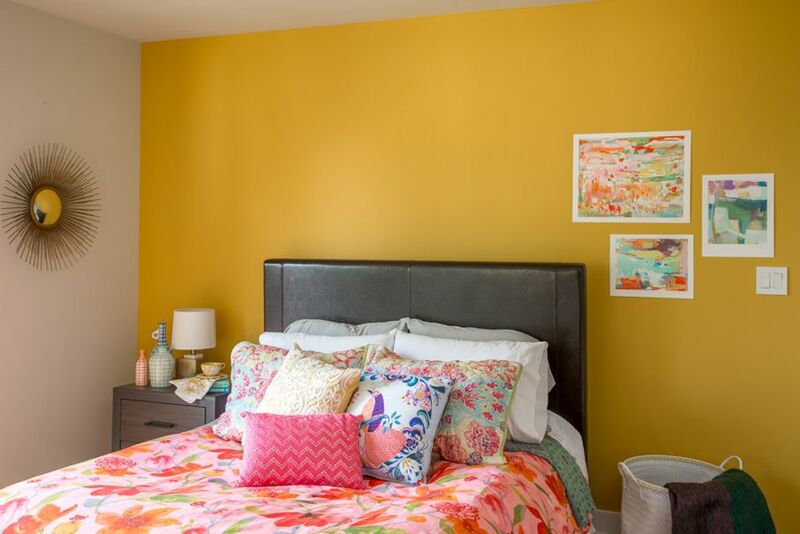 “Bold changes your room, your mood, your outlook,” said Sara McLean, color expert at Dunn-Edwards Paint, in explaining how Honey Glow came to be the chosen color for 2017. It harmonizes with a trend toward the warming of all colors that we see in design circles today. McLean spent months engaged in exhaustive research but says that intuition played an equal part in her selection, which she explains on a YouTube video. “We don’t pick a safe color. We want to give people a color that makes a statement,” she said. And certainly her research went beyond design palettes as she also drew her inspiration from the Olympics, stars and personalities, as well as trends in food and music. She recommends Honey Glow for an entire room or just an accessory wall, where it can be paired with white or gray, and embellished with pillows, throws, and other accessories in the Honey Glow color. Besides boldness, Honey Glow is seen as a symbolic marriage of joyfulness and intellect, evoking feelings of curiosity especially about the world around us. In developing Honey Glow as the year’s key color, McLean felt that it represents global and cultural trends toward warmth, the exploration of new territories, and celebrating life filled with color. Expect it to create new energy for years not just in your own home, but globally. That’s because for each purchase of Honey Glow, Dunn-Edwards will be donating 10 percent of sales to HoneyLove, a nonprofit working for bees’ survival at time when they are endangered. It is not surprising that Dunn-Edwards Paints would come up with a paint campaign that also comes to the rescue of these endangered creatures. At the Dwell on Design show, Bosveld told House Tipster how Dunn-Edwards has the world’s first LEED Gold-certified manufacturing plant in Phoenix, AZ. “It’s a green plant,” said Bosveld of the facility that opened in 2011. This focus started before today’s green movement gained momentum. The company was a disciplined leader in the concept of green product manufacturing long before it became popular. Want to really make a statement with your next room makeover? 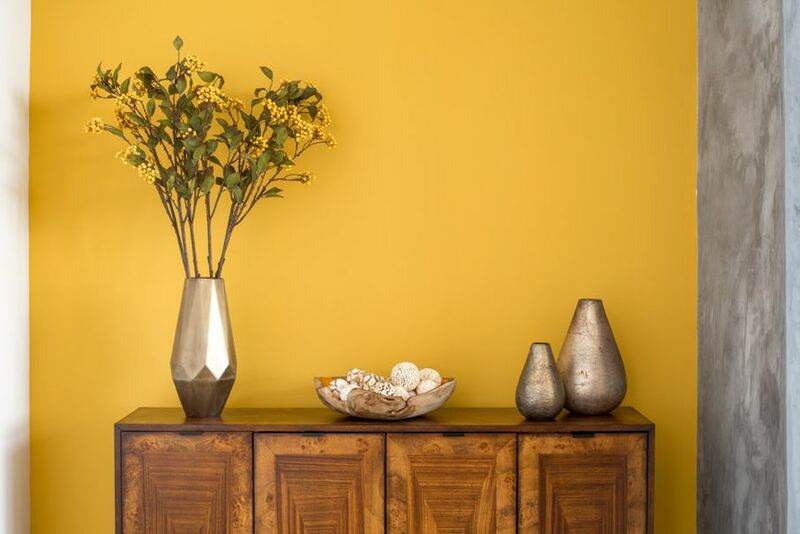 Look to the bees for a color that exemplifies boldness, warmth, and joy. It certainly caught our eye at the Dwell on Design show June 23-25.